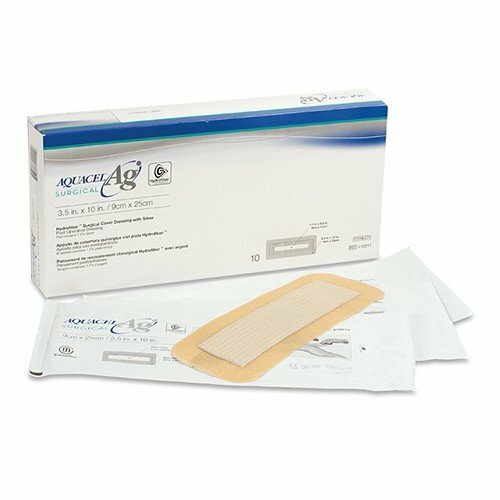 AQUACEL Ag Surgical Cover Dressing takes ConvaTec's proprietary Hydrofiber technology, hydrocolloid technology, and combines that with ionic silver for one incredible dressing. This reduces the number of items you need from three to one, saving you time and money. The combination also has health benefits. Some of these are, reduced frequency of dressing changes, risk of skin blistering by 88%, risk of surgical site infection by up to 76%, and delayed hospital discharge and readmissions by 80%. These benefits are due in part to the unique Hydrofiber technology. The technology transforms a soft, absorbent material to a gel when it touches wound exudate. This gel then creates an ideal environment for wound healing. As a gel, it can better contour to the wound bed and minimize areas for bacteria can grow. It also helps to maintain the wound bed's moisture balance that can be key for a healing wound. The cohesive gel works to trap bacteria and exudate. By trapping bacteria and exudate, maceration is reduced and the periwound skin is protected. Also, when it is removed, cross-infection and wound infection is minimized. When ionic silver is added to the Hydrofiber technology, it gains an antimicrobial property for improved healing. In addition, these surgical dressings are flexible to better conform to the body. This can increase comfort for the user, especially when combined with an adhesive that is skin-friendly both when adhering and when removing it. Another feature is the waterproof barrier. This barrier allows the user to bathe, while protecting the area from additional bacteria. Excellent product that provides complete sustainable waterproof covering on surgical incisions. This product is completely water and air tight with maximum protective bandaging of surgical area. Bathing and/or showering will not effect area of coverage. It protects incision for up to 14 days as advertised. Easy to apply but requires care to remove due to adhesive properties and adherence of bandage.